Armstrongs Group is proud to announce the first details of our 2018 Apprenticeship Scheme. On Wednesday 17th October 2018, we attended the National Apprenticeship Show at Bolton Arena to advertise our scheme and the types of apprenticeship opportunities we have available. This was also an excellent opportunity to invite our upcoming work placement student, Thomas, to come along and represent us. Thomas is joining our team on a 25 week college placement from Bolton Sixth Form College and will be placed with our Marketing and HR departments. Our Apprenticeship scheme is open to anyone 16+ and combines on the job training with teaching. The scheme will cover all areas of our business including: masonry, accounting, plant mechanics, transportation, HR administration and much more. Armstrongs Group are proud to support the national government apprenticeship scheme and are looking for anybody who is passionate, willing to learn, and hard working to apply. Previous experiences are not necessary and schemes will be tailored for successful candidates to ensure high quality and purposeful apprenticeships. A big part of our apprenticeship scheme will be engineering. 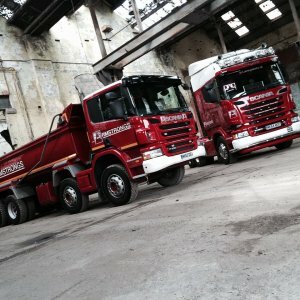 Armstrongs Group has 70 Scania tipper trucks ranging from 8 Wheeled to 14 wheeled, as well as plant machinery including Excavators and wheel loaders. Maintenance engineering will play a key role in our business expansion and will include a variety of technical skills. A maintenance engineer’s work will involve: checking, repairing and servicing machinery, equipment, systems and infrastructure. Our maintenance engineers will ensure the smooth running and reliability of our construction machinery from excavators and wheels loaders to our trucks and entire fleet. The apprenticeship will be based across our sites in Horwich, Clitheroe and Cumbria working and learning in a variety of different environments from quarry to office, Aggregates to AMIX. Keep an eye out on our website or our social media channels @ArmstrongsGroup for more information on when the Scheme is open for applicants. On Wednesday 17th October 2018, Our HR Manager Lesley, our Marketing and Web Content manager Daniel, and our Bolton Sixth Form College work placement student Thomas attended the national apprenticeship show at Bolton Arena. 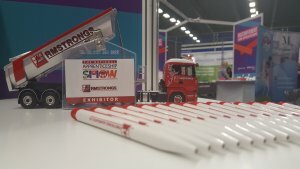 We attended the fair to showcase our new apprenticeship scheme that will be launching in the near future and to discuss career opportunities with students of all ages. The new apprenticeship programme is designed to immerse successful candidates in every aspect of our business from engineering to HR and everything in between. More details of our apprenticeship scheme will be available tomorrow in our blog! Armstrongs are a reliable supplier of all forms of stone material from rock armor or cut dimension stone down to aggregate, sand or dust. 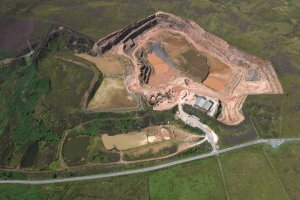 We operate five quarries across the North West and Cumbria. To do this we run an expansive and efficient fleet. In this blog we will identify the key machines within our business and welcome you to meet our fleet. To be able to operate these five quarries, our head office and stone workshop- as well as our AMIX Concrete subsidiary- Armstrongs has a strong and vast fleet of machines behind it. Our transport fleet has grown immensely over recent years. Continual investment by Armstrongs Group ensures we maintain maximum efficiency and reliability, whilst also meeting our environmental commitments. 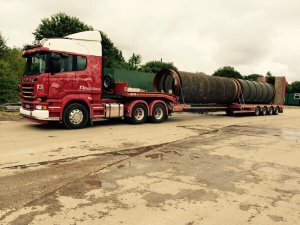 The Wagons in our fleet consist wholly of Scania’s who offer excellent service and product to the Group, and we are proud to have worked alongside them for a number of years. 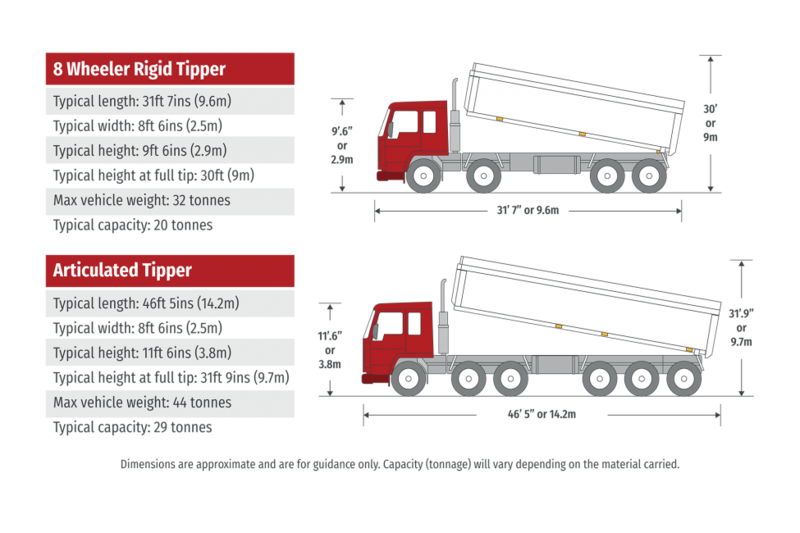 The aggregates business utilise 8 wheel tipper wagons for maximum flexibility and articulated tippers for maximum load carrying. We also have walking floor trailers and low loaders for the transportation of equipment. The high standard of reliability and service we provide is driven by an excellent team of fully qualified drivers, along with a strong safety record. Our new tracking system will facilitate the constant monitoring of driving styles to enhance this further. Armstrongs Group vehicles and trailers are serviced in line with regulations by our own workshops. Our workshops consist of a versatile and experienced a team of fitters at our disposal. Notwithstanding our work we are also very conscious of cleanliness and appearance and our drivers are responsible for their own vehicles. We also have an extensive range of heavy duty plant and machinery which is well invested and continually maintained by our internal fitters. The Armstrong group strongly believe in owning vehicles, plant and equipment because it caters for maximum flexibility and demonstrates our long term commitment to our customers, staff and the industry. 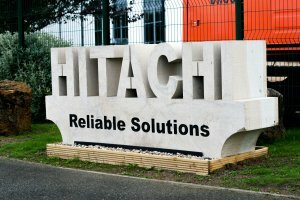 Our fleet of vehicle across our sites includes construction machinery from Hitachi, Bell and Case. The fleet of construction machinery we operate includes excavators, wheel loaders, dump trucks, haulers and bulldozers. the main fuel filter prevents dust from entering the fuel circuit. The ZX210LC-5 is a force to be reckoned with. It is easy to transport and is designed for sewer and water contractors, basement diggers and for work in urban areas. An Isuzu engine delivers fuel-efficient and reliable performance; grouped service points simplify maintenance; a spacious cab keeps operators comfortable. The ZX225USLC-6 is one of our most versatile medium excavators. This is due to its short-tail swing and a variety of optional extras. It was developed to deliver high levels of productivity and fuel efficiency, particularly if space is limited. 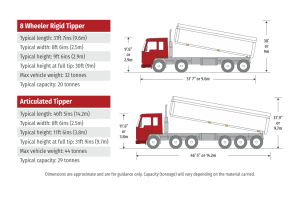 Due to its compact dimensions, it is suitable for a wider range of jobs than the standard 21-tonne model while retaining its powerful lifting force. The ZW310-6 is Hitachi’s most popular wheel loader in Europe due to its bucket capacity. It is suitable for loading trucks in quarries, waste handling applications and road construction projects. The quick power switch increases engine output when more power is instantly required or when driving uphill. 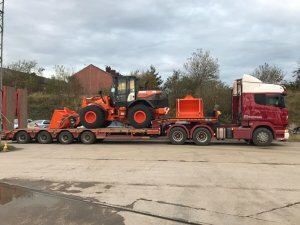 Hitachi’s design engineers have improved the traction force on this model by 25% for easier loading. 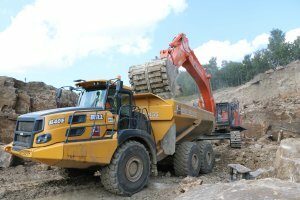 The B40E is a perfect truck for many plant and quarry fleets due to its greater power and increased payload. It delivers the best power-to-weight ratio in the industry at 5.37 kW/ton. This truck is a culmination of a five-year research and development program. As a result, the B40E has been engineered to handle future emissions requirements and incorporates the latest developments in 6×6 technologies. These technologies give you more in the way of performance and fuel efficiency improvements. The 2050M has a best-in-class horsepower of 214 hp, massive drawbar pull of nearly 81,000 lbs, fingertip controls and customizable steering. It also has shuttle and blade sensitivity settings that can be adjusted between Smooth, Moderate and Aggressive to match ground conditions and operator comfort. A new v-shaped cooling system with auto-reversing fan also helps maximize uptime by automatically clearing the cooling package of debris. 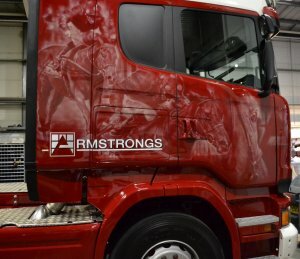 Armstrongs Group use Scania trucks exclusively for our fleet of trucks. We use many different models to get the job done. Our Flagship truck “Mayson” is an R520 whilst we also deploy a range of 8 Wheeler rigid tippers such as the: G410, P380, P400, P410, P450 & R410. 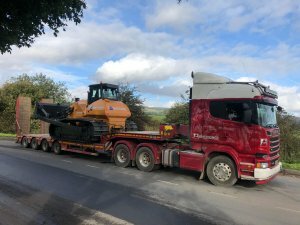 However, Armstrongs Group also use articulated tippers to help maximize our fleet and efficiency with the Scania P420 & R440 being a couple of our vehicles of choice. 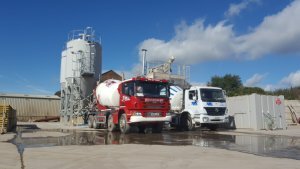 Our Amix Concrete mixers also utilize Scania as their vehicles of choice with the 6 wheeled P360 being our currently preferred model. For more information about our fleet you can visit our website or find us on Twitter, Facebook, Instagram and LinkedIn @ArmstrongsGroup. 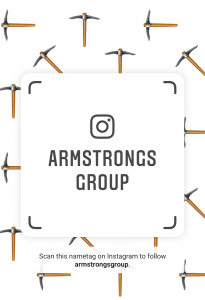 Over the past month and a half we have published an Armstrongs A to Z on our Instagram page in order to allow you to get to know our business better. Here is that A to Z compiled in a singular handy post. Enjoy! 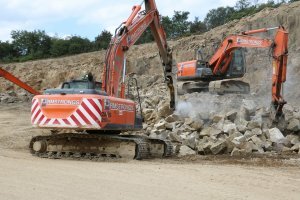 Direct from our own quarries we provide you with top quality aggregate materials for a range of applications. Brinscall Quarry covers 40 acres near the town of Chorley and has been operational in excess of one hundred years. 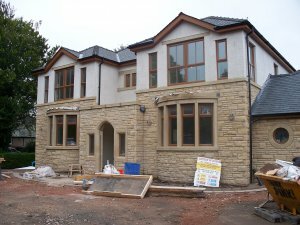 Brinscall stone is a highly desirable and attractive sandstone. It can be used as a building stone, including the present work on the Sagrada Familia cathedral in Barcelona. 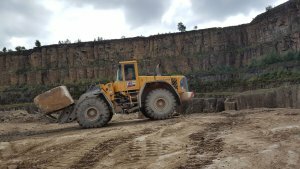 The Quarry has been worked in the traditional method of crushing and screening following blasting and extraction of dimension stone to produce aggregate materials. 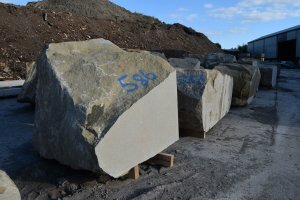 Dimensional stone is natural stone or rock that has been selected and finished (i.e., trimmed, cut, drilled, ground, or other) to specific sizes or shapes. Colour, texture and pattern, and surface finish of the stone are also normal requirements. Another important selection criterion is durability: the time measure of the ability of dimension stone to endure and to maintain its essential and distinctive characteristics of strength, resistance to decay, and appearance. 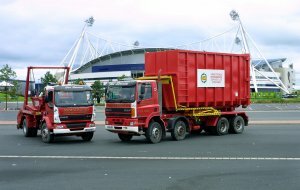 Did you know Armstrongs Group used to run Environmental Services and Waste management services? As you can see from our picture we also used to offer skip hire too! 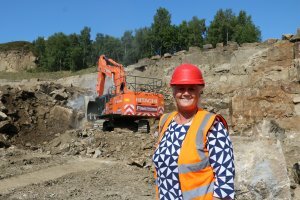 Our business may have now evolved into Quarrying and Aggregates but our high levels of customer service still remain the same! Our transport fleet has grown immensely over recent years, and continual investment by the Armstrong Group ensures we maintain maximum efficiency and reliability, whilst also meeting our environmental commitments. 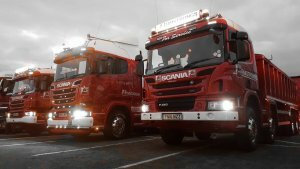 Our fleet of Wagons consist wholly of Scania’s who offer excellent service and product to the Group. 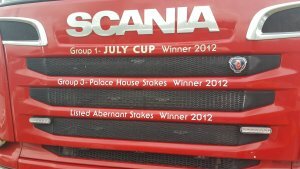 We are proud to have worked alongside Scania for a number of years. The aggregates business utilise 8 wheel tipper wagons for maximum flexibility and articulated tippers for maximum load carrying. We also have walking floor trailers and low loaders for the transportation of equipment. Our high standard of reliability and service is driven by an excellent team of fully qualified drivers, along with a strong safety record. A new tracking system will facilitate the constant monitoring of driving styles to enhance this further. Our vehicles and trailers are services in line with regulations by our own workshops. This consists of a versatile and experienced team of fitters. Notwithstanding our work we are also very conscious of cleanliness and appearance and our drivers are responsible for their own vehicles. 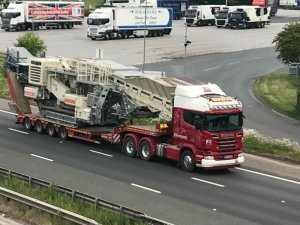 The Armstrong Group also have an extensive range of heavy duty plant and machinery which is well invested and continually maintained by our internal fitters. The Armstrong group strongly believe in owning vehicles, plant and equipment as it caters for maximum flexibility and demonstrates our long term commitment to our customers, staff and the industry. Gritstone is a hard, coarse-grained, siliceous sandstone. This term is especially applied to such sandstones that are quarried for building material. 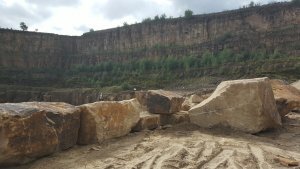 Our Gritstone predominantly comes from our Montcliffe quarry and is blasted in the traditional way. It is then used for dimension stone in building works or crushed and screened for aggregates. 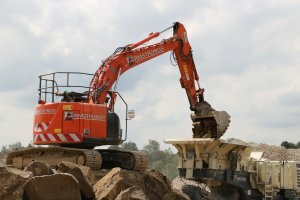 Here at Armstrongs Group we use a wide variety of Hitachi construction machinery to get the job done! Ranging from the Hitachi ZW310 wheel loader to the Hitachi ZAXIS 690 excavator the reliable construction machinery allows us to keep up with demand and supply high quality products. Inert waste is waste which is neither chemically nor biologically reactive and will not decompose. Examples of this are sand and concrete. This has particular relevance to landfills as inert waste typically requires lower disposal fees than biodegradable waste or hazardous waste. 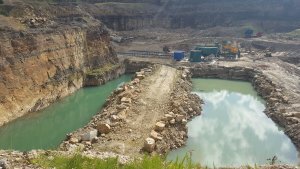 We have two quarries at Pilkington and Pilkington 1 is exhausted but carries permissions to receive 2M tones of inert waste. 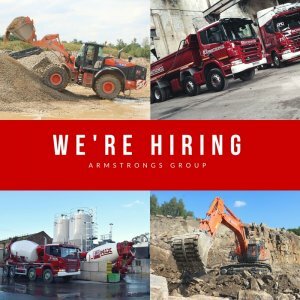 The Armstrongs Group continuously look to recruit for our ever growing business. We hire passionate and personable people with the right set of skills regardless of experience. Here at Armstrongs Group we like to provide jobs for our local community. 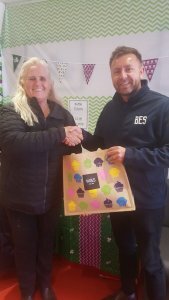 We also like to give back to our local community and often raise money for local charities as well as being hands on in our community! Basilica de la Sagrada Familia is a large unfinished Roman Catholic church in Barcelona. It is designed by Catalan architect Antoni Gaudí. The stone used for the bell towers on the Nativity and Passion facades is sandstone from Montjuic in Barcelona. The quarries in this region were exhausted and closed many years ago thus meaning original stone could only be sourced from demolished buildings. So began a worldwide search for stone that would match that already used. It is through this process that the sandstone from Brinscall Quarry, near Chorley, was selected. 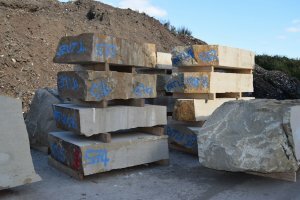 It is to the Armstrongs Group pride that since being identified we have shipped many loads of faced stone to be further cut in Barcelona. Montcliffe Quarry covers 64 acres near the town of Horwich.It has been operational for in excess of one hundred years. 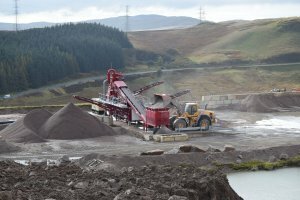 It is a gritstone (a well cemented sandstone) quarry worked in the traditional method of crushing and screening following blasting to produce aggregate materials. 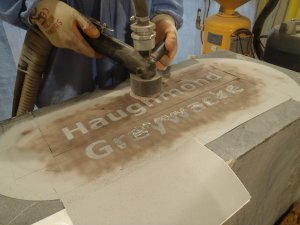 Armstrongs group are a reliable producer of all stone material from Aggregates to Cut Stone and everything in between. 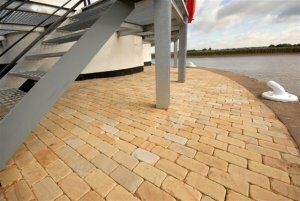 Our products are ideal for new build houses, be that our Ready Mix Concrete or our bespoke cut dimensional stone bricks and paving stones. The leadership team at Armstrong’s are all time-served and experienced. Our team comes from a variety of backgrounds. They offering differing skills and expertise that blend together to present great solutions and service. We believe that people deal with people they like. This is why we will always go out of our way to ensure that you come back to us time after time. We live in the communities that we serve and take great pride in helping to develop both the infrastructure and amenities within those areas. 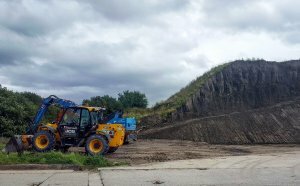 Pilkington Quarry covers 53 acres near the town of Horwich and has been operational for in excess of one hundred years. Pilkington 1 is exhausted but carries permissions to receive 2M tones of inerts waste, whilst Pilkington 2 is as yet unmined but carries a pale buff/brown highly durable gritstone. 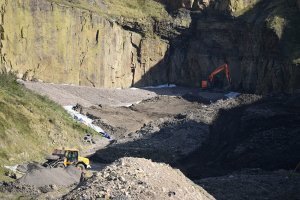 The Armstrongs Group operates 5 quarries in the North West and Cumbria. Those five quarries are located at Brinscall, Montcliffe, Pilkington, Shap and Waddington Fell. Combined they cover 276 Acres with Brinscall covering the smallest area at 40 acres and Waddington Fell covering the highest area at 66 Acres. 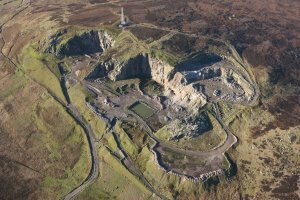 Both Pilkington and Shap cover 53 Acres whilst Montcliffe is our second largest quarry at 64 Acres. Each one of our five quarries serves a different purpose and yields different stone produce. We can supply any mix design you require for the job required. Ranging from GEN1 to RC50 (footings to motorway precast concrete). We use pure portland cement in all our mixes so you can be guaranteed consistent quality every time. A full range of admixtures are available on request. Such as liquid retarder, during hot weather and AEA (air entraining agent) which prevents cracking of hardened concrete during extreme freeze thaw temperatures. We are also able to provide accelerator admixtures which will provide seven day strength within 24 hours of placement. 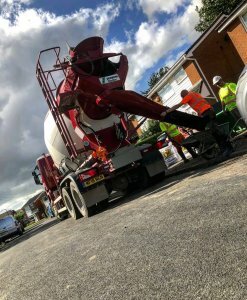 If you require groundworking concrete for curbs, drains and fencing then we can supply concrete for all applications. 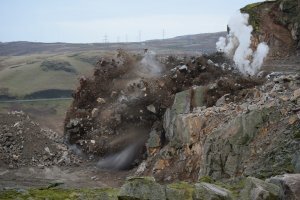 Shap Quarry covers 53 acres near the village of Shap and has been in operation since 1950. It is the home of Shap Pink granite, a widely used decorative building stone. The site yields two types of stone, Light Shap primarily worked as aggregate and Dark Shap used architecturally, one example being the historic Midland Hotel in Manchester. It is also worked traditionally with high demand presently for Rock Armour to build sea and river defences. Here at Armstrongs we have a number of stone tumblers to meet any order. Our tumblers give a rounded edge to our bricks and paving stones, giving a very popular smoother aesthetic. Customer Service is incredibly important to us at Armstrongs and that’s why we pride ourselves on understanding our customers. We have experienced and friendly staff waiting to help you to the bets of our abilities. We offer bespoke tailored services to every client to make you truly feel like part of our family. Armstrongs Group uses a variety of different construction machinery to get the job done. This includes excavators and wheel loaders from Volvo. 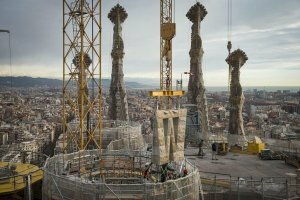 In this picture we see our Volvo machinery shifting the stone from Brinscall Quarry that is used in Barcelona for La Sagrada Familia. 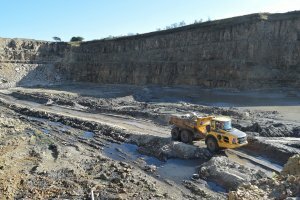 Waddington Fell Quarry covers 66 acres near the town of Clitheroe, and has been operational since the 1960’s. 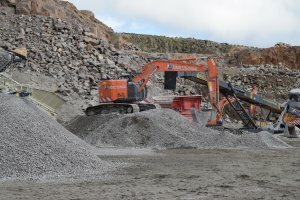 The quarry offers a range of sandstones, variable in strength and colour and has been worked in the traditional method of crushing and screening following blasting to produce aggregate materials. The stone from Waddington fell also forms excellent cut products such as fireplaces, lintels, even complete houses. Our range of wired and fixed saws allow for all varieties of cut stone and dimensional stone products. Our Dimensional Stone requires for a X-Section to be cut at one side of our stone. Once the stone is cut it allows for our stone masons to assess the structural integrity and markings of the stone before identifying its uses. It is important that the structural integrity and markings are assessed by our stone masons and by architects from our clients. This is so that we can provide the highest quality and strongest structural integrity in our products. Our yard is home to our stone shed, AMIX Concrete batching plant and houses all 70 of our truck. It’s an integral part of our business and is always a hive of activity. 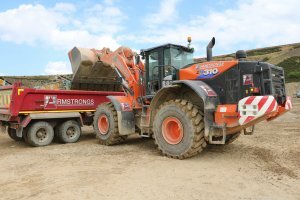 Armstrongs Group uses a wide range of Hitachi Construction machinery to get the job done at our quarries. 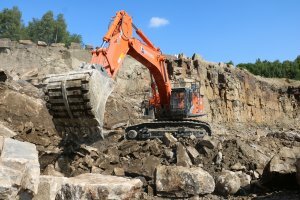 An integral part of that machinery fleet is the ZAXIS series with the ZAXIS 690 being one of our key excavators out in the quarries. 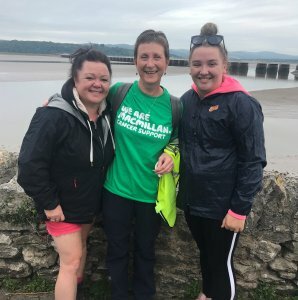 If you have any enquiries about our A to Z contact us today! 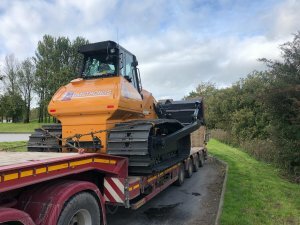 Armstrongs Group recently took new delivery of a Case 2050 bulldozer to be used at our Pilkington quarry.